1. The Way In:…..8’46”. Njacko on Celestial Harp, bassdrum, balaphone and voice. 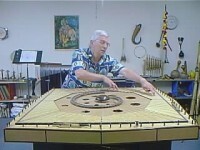 Robin on Celestial Harp. 2. Secret:…..10’12”. 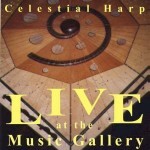 Njacko on Celestial Harp, and tubes. Robin on Celestial Harp, e-bow on Celestial Harp and tubes. 3. Yok (Soul):…..10’53”. Njacko on Celestial Harp, Kalimba & Slenthem. Robin on water drum, rainstick and anklung. 4. Travelling Soul:…..8’46”. 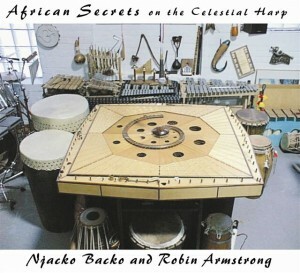 Njacko on Celestial Harp, vibraphone, djembe, shakers & voice. 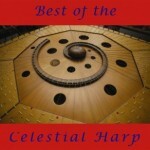 Robin on Celestial Harp, slenthem, kpanlogo, shakers and voice. 5. Nyam:…..8’42”. Njacko on Celestial Harp, bass drum, kpanlogo, shakers & box shaker. 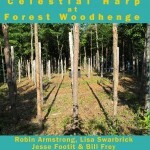 Robin on Celestial Harp and harmonica. 6. Thanks To The Spirit:…..7’05”. 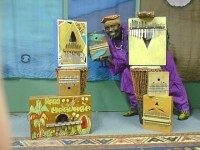 Njacko on Celestial Harp, kalimba, buba drum, coil, bongos & voice. 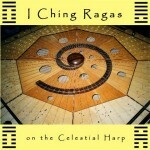 Robin on Celestial Harp, shakers & quiro. Morenike Marcus-Jones on voice.